Symptoms of cancer in cats can be very broad and hard to uncover. Whether it’s a subtle change in appetite or abnormal behavior, paying close attention to your pet’s overall demeanor is key to their overall health. Depending on the type and severity, identifying signs of a health issue in your cat can be quite difficult. Just like in humans, cancer is among the most common killers in aging felines. That is why it is critically important to spot the signs as soon as possible in order to fix the underlying problem. Below are key symptoms of cancer in cats. If your furry friend displays any of these signs for a prolonged period of time, make an appointment with your vet immediately. Cancer is not a death sentence for cats, however, early treatment is crucial for their recovery. One of the most common symptoms of cancer in cats is weight loss. Pay attention if your cat no longer enjoys feeding time. An indication that something is wrong in your pet is when they experience a loss of appetite. On the other hand, if their appetite has remained the same, but they are still losing weight, it may be cause for alarm. Whether it’s cancer or a food allergy, any change in eating habits is a serious concern. On the contrary, if your cat’s appetite spikes or they experience an increase in weight gain while having regular eating habits, then this can also be a sign of cancer. Any change in weight should be checked out by your vet. Has your cat experienced any unexplained bleeding or discharge from the eyes or nose? If so, this may be a sign of tissue cancer. Both bleeding and discharge can be key indicators that a health issue is present in your cat. Cats are not very social animals. Each cat’s personality varies significantly, some being more independent than others. For our furry friends who may be considered antisocial or distant by nature, it’s quite common for them to have their favorite hiding spots around the house that they retreat to when too many people are in the room. If you notice they’ve been missing the entire day and don’t even venture out for dinner, this is likely a sign that there may be deeper issues. Often, when animals become sick, they will hide in different areas for an extended period of time. 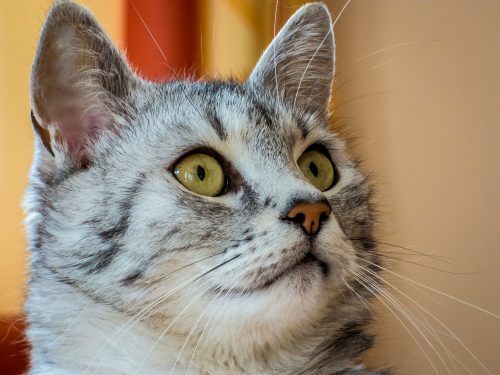 If you’ve noticed that your cat has any bumps, lumps, inflammation, or sores on their skin, then you should take him to the vet as soon as possible. These skin changes can be completely harmless and benign. However, if it is cancerous, the sooner it gets treated, the higher the chance your pet has for recovery. Prolonged diarrhea or difficulty urinating can both be symptoms of cancer in cats. An upset stomach or food allergy can cause changes in bathroom habits, however, if it is happening over an extensive period, then a visit to the vet should be in order. Along with this, notice if your cat is experiencing excessive hairballs or vomiting. All of these signs can be normal, so do not jump to any conclusions right away. Consider the frequency that these symptoms are occurring, and if you believe it’s more than normal, then it’s time to contact your vet. You want to give your furry friend the best life possible, and do whatever you can to give them the life they deserve. Start by taking preventative steps to avoid cancer later on in life for your cat. Here are some helpful tips to help beat the odds when it comes to battling feline cancer. While this list of symptoms encapsulates the main signs of cancer in cats, there are also other health issues that may still occur. The best way to make sure your cat is healthy is by having regular check-ups with your vet. The sooner an issue is detected, the faster your cat can be cured. Your vet is your number one source for information when it comes to your pet’s health.